A rise in multinational companies locating assets here likely helped drive the huge growth. IRELAND’S GROSS DOMESTIC product (GDP) grew by a huge 26% last year as it likely received a massive boost from companies relocating assets to the country from abroad. According to figures from the Central Statistics Office, Ireland’s GDP, which measures all the goods and services produced by the country, rose by 26.3% in real terms last year. This figure is up massively on the organisation’s previous forecast, which predicted that GDP would grow by about 7.8%. Gross National Product (GNP), the amount of income produced and retained by citizens of a country, also shot up by a massive 18.7%. This puts Ireland head and shoulders above every other country in the eurozone. According to figures from European statistics agency Eurostat, the eurozone country with the second strongest growth after Ireland was Luxembourg, which saw its GDP rise by 4.8%. GNP is often used as a better benchmark for Irish growth as it is generally accepted that the country’s GDP is skewed due to the large number of foreign owned multinationals based here, many of which send some of their earnings abroad. The 2015 figures appear to have been skewed due to a series of one-off occurrences. As previously highlighted by Fora, it is likely that many multinational companies are moving their intellectual properties to Ireland, resulting in a huge spike in Irish earnings. Another possible factor is where companies carry out ‘inversion’ deals. This is where businesses move their official headquarters to Ireland but keep the bulk of their actual operations abroad. However under these arrangements they would still be classified as an ‘Irish’ company in the figures. Activity in the aircraft-leasing sector was also cited as a major influence on the headline figures. Many aircraft-leasing companies, which often participate in massive multi-million euro international deals, are based in Ireland. However even with that accounted for there are indications that the underlying economy grew very strongly during the year. Personal consumption, perhaps a better benchmark than GDP or GNP as it indicates how much ‘ordinary’ Irish people were spending, rose by 4.5% during 2015. Exports grew by 34.4% between 2014 and 2015 while imports rose by 21.7%. 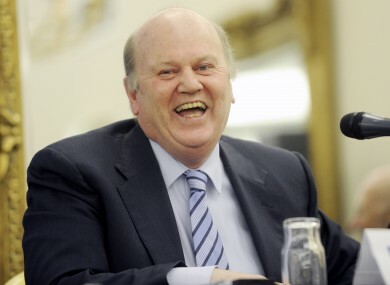 Finance Minister Michael Noonan said that the revised figures will have an impact on both the country’s deficit and its debt. Ireland’s debt to GDP ratio is now estimated at 80%, down from the 88% it was pegged at in the recently released summer economic statement. “I think the figures released by the Central Statistics Office show that Ireland’s economy continues to grow,” he said. “Peoples’ lives are improving with more at work than at any time since the onset of the downturn. The figures were much less dramatic for the first quarter of this year. The CSO said its “initial estimates indicate” that GDP decreased by 2.1% during the three month period, while GNP grew by 1.3%, although the figures may again be skewed due to their comparison to 2015. Email “The second best eurozone economy grew by 5% in 2015. Ireland's expanded by an insane 26%”. Feedback on “The second best eurozone economy grew by 5% in 2015. Ireland's expanded by an insane 26%”.